It’s one of our first interactions with a Hawaiian local, and one of the most typical. Aloha means love, kindness, unity and patience…a philosophy of going gently and living in joy every day. 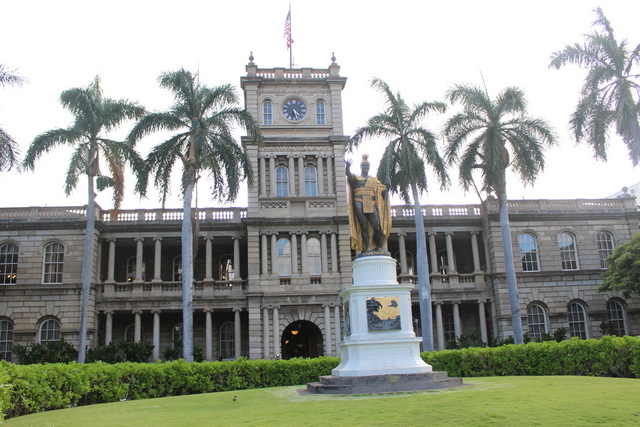 Hawaiians are some of the friendliest people in the world, renowned for their welcome and their love of food; surely both are reason enough to go visit this group of islands, the 50th state of the US. 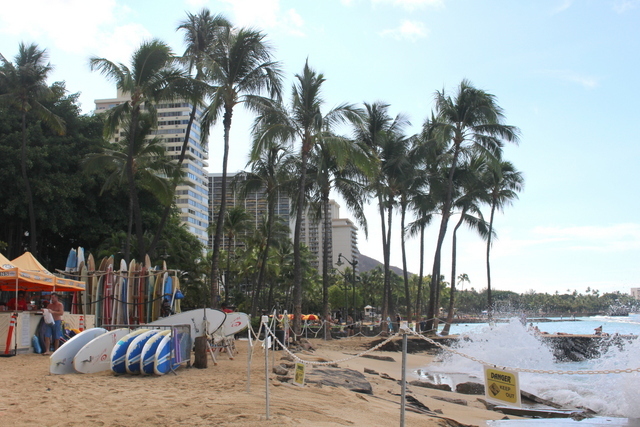 Today there are 1.3 million people on Oahu; an interesting mix of many ethnicities. 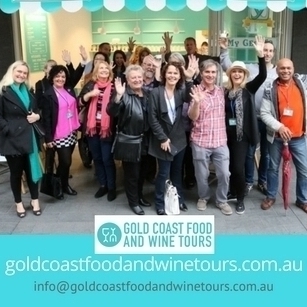 Of the many and varied ways to find out about the culture you are visiting, a food tour must be one of the most enjoyable. Not only that, but while you eat, watch and listen, you’ll gather lots of peripheral information about history and culture, tips about restaurants and dishes to try, shops you want to come back to, and you’ll meet other tourists with similar interests. ‘Hawaii Food Tours’ runs several food tours, including the ‘Hole in the Wall’ tour, a great introduction to Hawaiian food haunts within easy reach of Waikiki, where most tourists stay. The guides on our Hole-in-the-Wall Tour are Krystal and Dennis (AKA ‘Big Bear’), a local who spent many years as a chef in both Hawaii and the US, now one of the main guides working for Chef Matthew Gray’s company. Dennis tells us many stories about food and culture in Hawaii, and what he doesn’t know, he’s willing to find out! Before our first stop, we pass through the business district of town, viewing government and FBI buildings and the edge of the port, where a huge cruise ship is docked. The gracious buildings of this quarter smack of colonial grandeur, in sharp comparison to weathered houses on other parts of the island. This disparity also applies to food on the island – from dishes invented to solve problems through to haute cuisine, Spam to poke, there’s something for everyone on this culinary journey and each dish carries its own story. 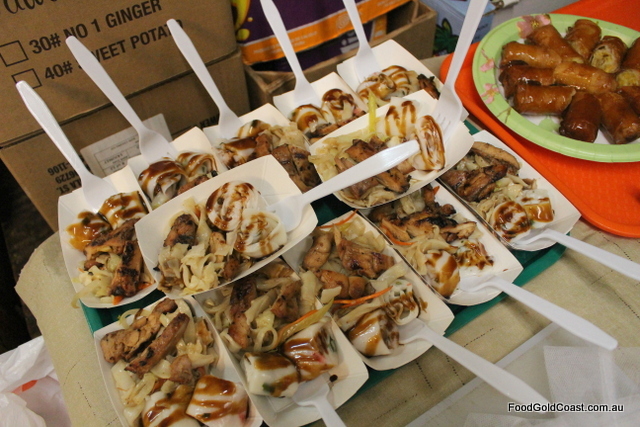 Besides the obvious military presence and tourism-centric activities, food has been one of the main industries on the island. There’s still evidence of sugar cane and pineapples, formerly grown as major crops. Krystal points out the former Dole (pineapple) Cannery, a major employer for many years, with founder James Dole at one time growing 75% of the world’s pineapples. 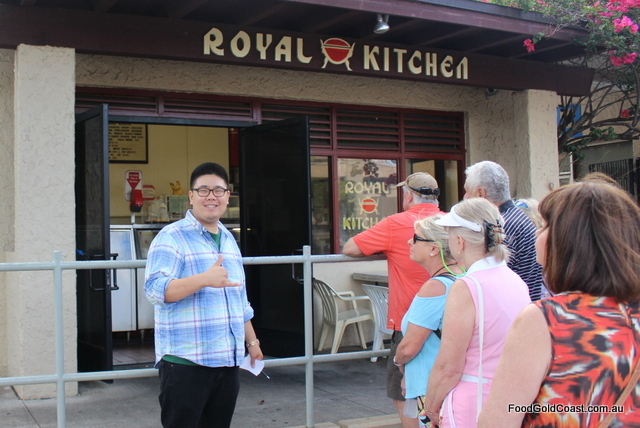 Our first stop is The Royal Kitchen, a humble bakery that makes the best manapua on the island. 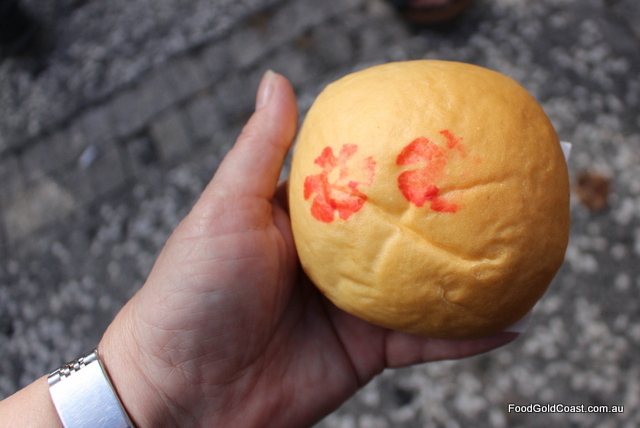 Dating back to the 1800s, manapua were introduced by Chinese workers as a quick snack to eat for lunch before they had to go back to work on the plantation. 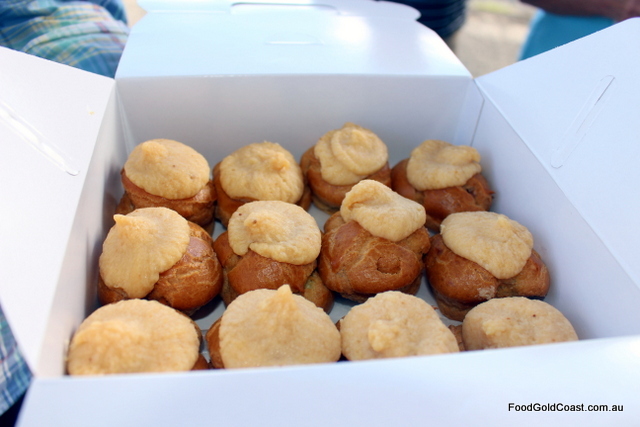 A Chinese-Hawaiian fusion dish based on Chinese bao, these meat-filled soft sweet buns (similar in consistency to a milk bun) became so popular that when the Chinese workers’ contracts finished, they continued to peddle manapau on the streets, carried in baskets on poles across their shoulders. Today they’re so popular that they’re even sold in 7-Eleven shops but, as always, Dennis tells us, fresh is best, The Royal Kitchen’s version highly regarded with a choice of ten fillings baked inside the bun, including char sui, kalua pig, chicken curry, lup chong (Chinese sausage), Portuguese sausage, and sweet versions with black sugar, coconut and sweet potato. How can you tell which bun is which? Their filling is stamped on the top. 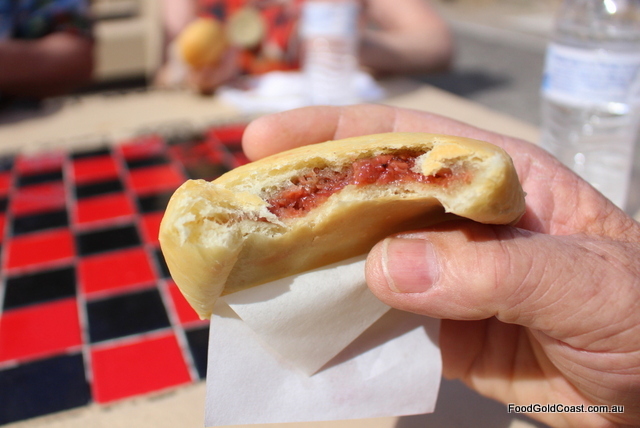 We discover another local obsession on our next stop: the coco puff. 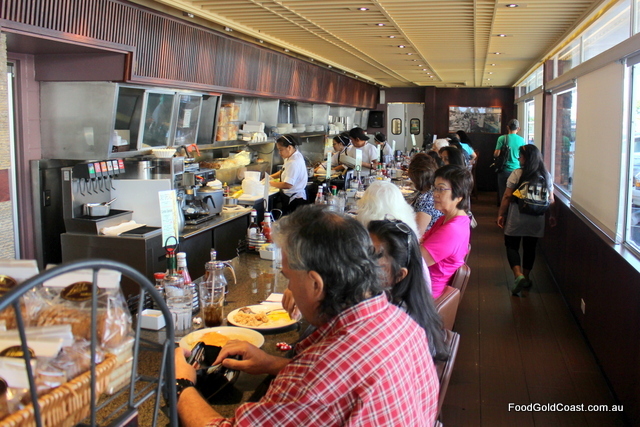 Liliha Bakery’s puffs are renowned, with about 5,000 puffs sold daily.The venue’s also a pretty cool diner. With a choux pastry-like crust, the chocolate-filled puffs topped with Chantilly cream are served cold. With savoury and sweet treats on board, it’s time to hit Chinatown. More subdued than many other Chinatowns around the world, there’s still plenty of commercial activity going on, more local-based than tourist oriented. We pass souvenir, lei and flower shops, as well as traditional medicine and acupuncture specialists as we head into the centre of Chinatown. Centred around Kekaulike and N. King streets are several famous markets which you might recognise from movie sets, such as Skull Island. 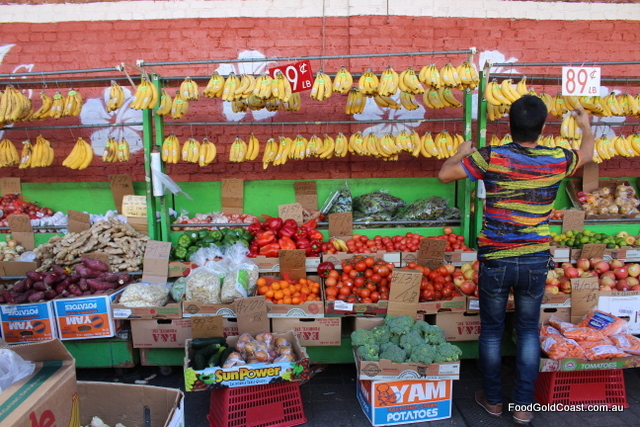 More importantly to locals, they’re a place where vegetables and fruit, fish and meat can be purchased far more cheaply than in town. We’re here to sample more Chinese specialties: rice noodles (those yummy flat noodles eaten at yum cha all over the world) made by hand at Look Funn Factory, and apple banana lumpia in caramel sauce (a sweet version of spring rolls), half-moon dim sum filled pork, shrimp and water chestnuts with dipped into spicy mustard sauce. We’ve had several versions of poke on the island, however Dono’s Café is the best tasting version, if not the prettiest; rich belly tuna served simply with scallions, sesame oil and sweet Hawaiian soy. Delicious! 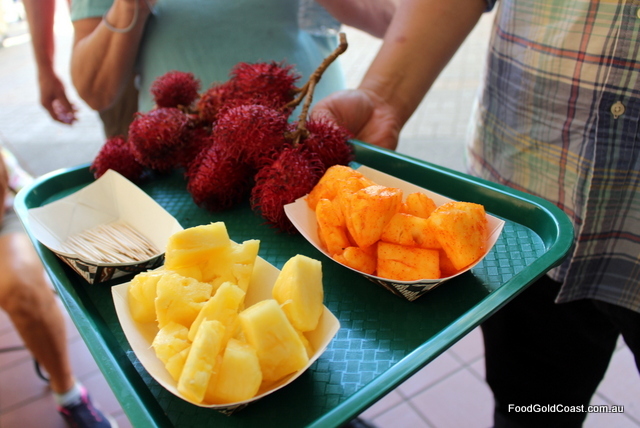 We finish the stop with some tropical fruit: rambutan, pineapple rolled in lee ling (salty plum) powder (the way that locals love to eat their fruit), which they also serve in their fruit juice. Perhaps there’s an influence there on the salty and more savoury sweets beginning to appear on Gold Coast menus. 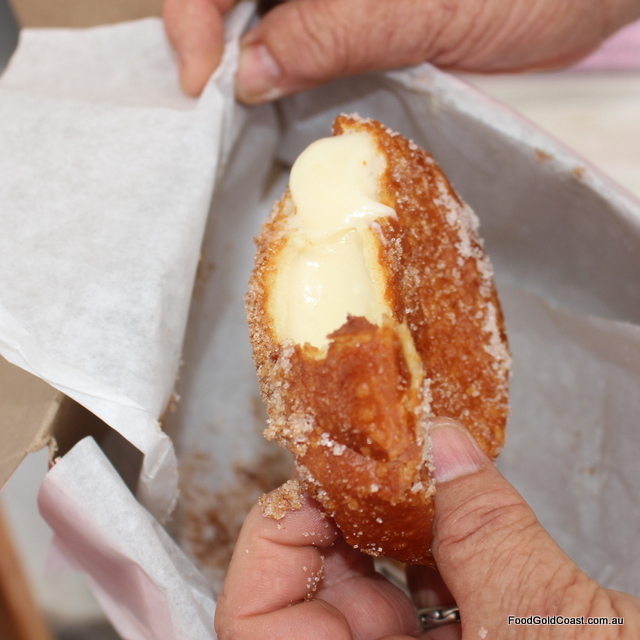 No Hawaiian food tour would be complete without malasadas, Hawaii’s answer to the doughnut. 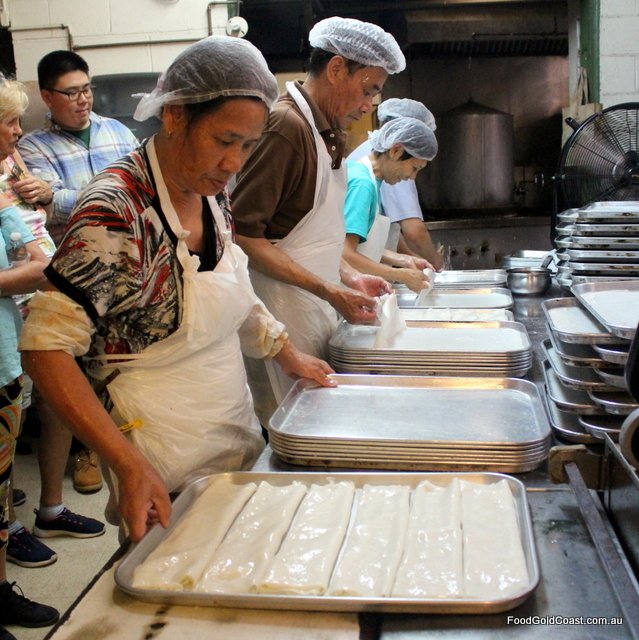 These deep-fried balls of yeast dough rolled in sugar can be purchased throughout the island, however there are only a few places where they’re made to order, Leonard’s being the most famous. This family-run restaurant commenced trade in 1952, their pink boxes easily identifiable around town. Three and a half hours after setting out, we return to our hotel richer in our knowledge of the island, holding a list of restaurants and shops we’d like to return to and ready to sample more of the island’s produce. Rum and pineapple juice. 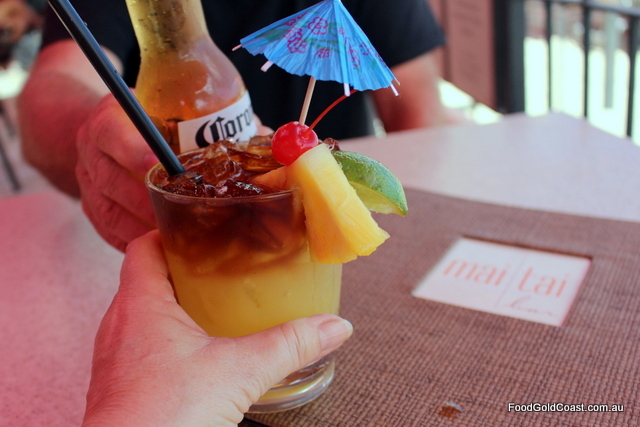 As the sun sets and light fades over the ocean at Waikiki, they’re ‘need-to-know’ agricultural products as we tuck into one of the best Mai Tai we’ve tasted at the Royal Hawaiian’s Aloha Hour. They may not carry the honour of best Mai Tai for 2017 in the annual competition, but that bar is on our list for later! 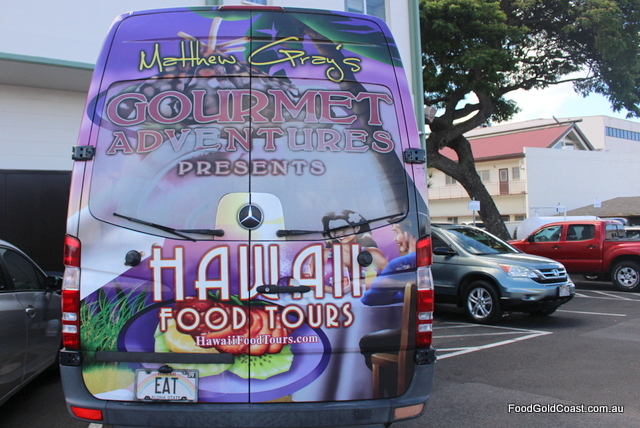 Hawaiian Food Tours also run a North Shore tour. Traversing the mountains to the other side of Oahu, the tour hugs the coastline back to Waikiki, showing off towering mountains, several of Hawaii’s most famous beaches and North Shore break and lush tropical rainforest used as the set of Jurassic Park. This tour visits Hawaii’s most famous Polynesian restaurant to sample traditional Hawaiian food (Kalua Pig, lomi salmon, hand-pounded fresh poi, haupia, and pork lau lau), while at other stops we eat succulent garlic shrimp, haupia chocolate cream pie, local coffee and freshly made malasadas. NOTE: Hole in the Wall Tour duration is approximately 5 hours. Cost $129 per person at time of publication. 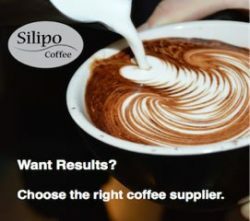 Check Hawaii Food Tours’s website to verify latest prices and details.